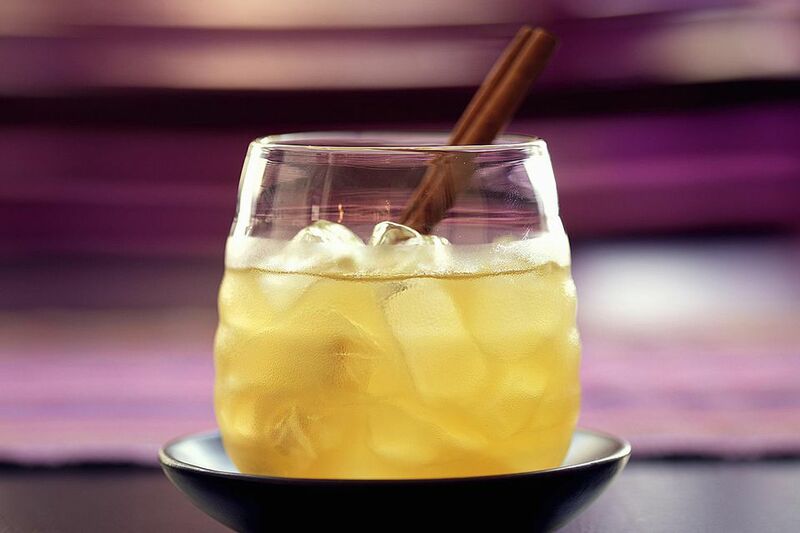 Enjoy a great Japanese whiskey and apple cider in the same glass with the autumn delight cocktail. It's a very simple recipe that features the two ingredients with a hint of cinnamon, offering a seasonal way to experience the fine taste of Yamazaki 12 Year Whisky. The recipe comes from The House of Suntory, the premier makers of Japanese whisky that put the country's burgeoning whisky scene on the worldwide map. Specifically, it uses the flagship from the Yamazaki range, a nice single malt that is aged for 12 years, making it perfectly mixable. It's the ideal way to spike your cider and enjoy a wonderful (and incredibly easy) autumn cocktail. Shake and strain into an ice-filled old-fashioned glass. Dust with fresh cinnamon and garnish with apple slices and a cinnamon stick. If you're tempted to skip any of the garnishes, keep at least one version of cinnamon, whether it's the stick or the ground cinnamon. It adds an extra depth of flavor and the warm spice completes the drink's experience. The nice part about the cinnamon stick is that it doubles as a stir stick! When cutting apple garnishes, be sure to dunk them in lemon juice immediately after slicing. This will stop the natural reaction that turns the fruit's flesh yellow once it's exposed to oxygen. For the best tasting autumn delight, look for unfiltered apple cider. It's typically around during the autumn apple harvest, either in the grocer's produce section or direct from the orchard. If you love a project in the kitchen and an apple tree in the backyard, make your own apple cider. It's easiest when done in a slow cooker and can be seasoned with spices like cinnamon, cloves, and nutmeg. If you are in the mood for a hot drink, heat up the cider before adding the whisky. Skip the ice, of course, and simply stir the drink as if it is a hot toddy. Give the drink a boost by adding 1 ounce of cinnamon schnapps. Make sure it's a high-end brand (e.g., Goldschläger) that matches the whisky's quality. How Strong Is an Autumn Delight? Yamazaki 12 is bottled at 86 proof, so it's a full-flavored whisky that will stand up to apple cider. For being just a little stronger than the average whiskey, when mixed into this recipe, the resulting drink is surprisingly light. You can expect it to fall in the 13 percent ABV (26 proof) range, making it a perfectly casual sipper that's about as strong as a glass of wine.